It is with heartfelt sadness the family of Wally Hutcheon announce his passing. Wally was born on August 9, 1930 in Rosetown, SK. He passed away peacefully with family by his side on May 22, 2018 at the age of 87 years at the Royal University Hospital in Saskatoon, SK. Wally attended Eagle Crest School until his family moved to Saskatoon where he completed high school at Nutana Collegiate. He married Margaret Elizabeth Dunlop “Beth” on September 28, 1957. Together they raised four children on the farm north of Rosetown. Wally was a hard-working, meticulous farmer and carpenter. He helped construct many buildings in Rosetown such as the United Church Hall, the Catholic Church and the Rosetown Arena. 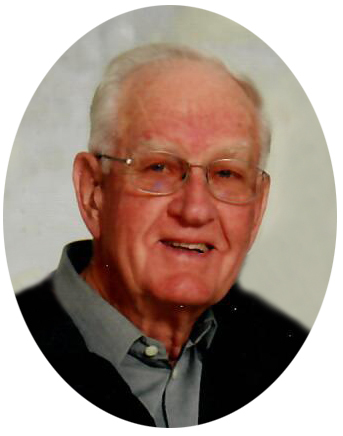 Wally had a strong community spirit serving as a Kinsmen, K-40, United Church Board of Stewards, School Board and Hospital Board member. He volunteered as the manager of his son’s hockey team for several years and as a driver for many school field trips. Wally loved the crocuses in the spring and when the last load of grain was in the bin in the fall. He will be remembered for his sense of humorous, his mischievous spirit and how he called a spade a spade. Wally is survived by his loving wife of 60 years, Margaret Elizabeth Hutcheon (née Dunlop) “Beth”, children Kathy (Craig) James of Calgary, AB, Barb Hutcheon of Regina, SK, Sandra Hutcheon-Wagner of Saskatoon, SK and Paul (Lisa) Hutcheon of Rosetown, SK; grandchildren Evan (Leya) James, Kerianne James, Erin James, Kayla (Josh) Martinook, Dr. Amy Wagner, Jill Wagner and Mitchell Wagner; great-grandchildren Zane and Kohen Labbe and Bennett and Willow James; sisters Betty (Jack) Crossman, Jean (Don) Wickett; sister-in-law Marilyn (Tom) Miles and numerous nieces and nephews and their families. He was predeceased by his parents William and Ebena Hutcheon, in-laws William and Margaret Dunlop, brother Jim Hutcheon, sister-in-law Laverne Hutcheon, sister Joyce Crossman, sister-in-law Dona Dunlop and nephews Gregg Wickett and David Crossman. Sincere thanks to all for your condolences and acts of kindness. Funeral Service will be held on Friday, June 1, 2018 at 2:00 p.m. at the Rosetown United Church with Reverend Jo-Ann Hills officiating. Donations in memory of Wally may be made to Rosetown Cemetery Beautification, c/o Town of Rosetown, P.O. Box 398, Rosetown, SK S0L 2V0.